Do you often feel tired or in need of a healthy, all-natural energy boost? Here’s your healthiest solution: greens+ extra energy. 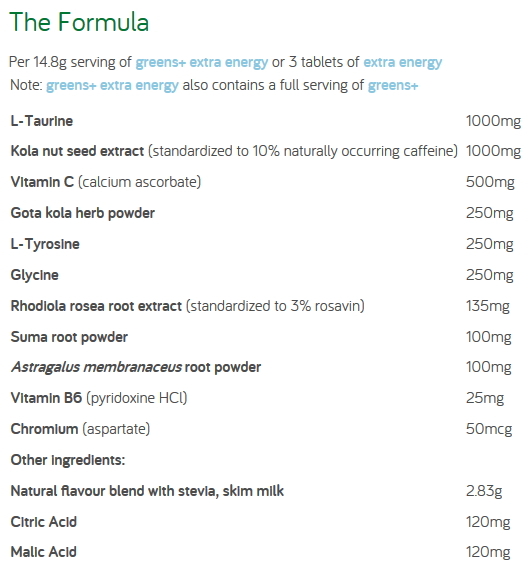 With greens+ extra energy, you get all-natural energizing ingredients including taurine and naturally occurring caffeine from the kola nut, PLUS a full serving of nutrient-rich greens+ in every scoop! Just one scoop daily provides immediate, long-lasting energy, along with essential nutrients for a healthier, energized body – naturally. Dosage: To improve overall well-being, to (temporarily) promote alertness, wakefulness, enhance cognitive performance, relieve fatigue, increase endurance and enhance motor performance, mix 1 scoop (14.8g) of greens+ extra energy to one and a half cups (375mL) of pure water. Shake well. If you are a new user of greens+, begin with 1/3 scoop daily and gradually increase to a full scoop daily over a 3 week period. Genuine Health Fast Arthritis Relief+ 120 C Genuine Health Inc.
Genuine Health Fermented Vegan Proteins+ Unflavoured 600G Genuine Health Inc.
Genuine Health Fermented Vegan Proteins+ Natural Vanilla 600 g Genuine Health Inc.
Genuine Health O3mega+ Joy 240 Softgels Genuine Health Inc.